Woof. The air forcibly left my abdomen in a rush. That’s a bunch of heavy words for one sentence. 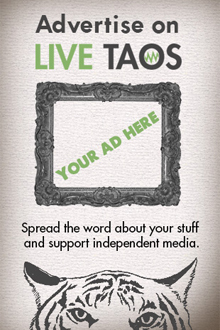 I thought, “How am I going to write about this on Live Taos? I do food reviews for crying out loud! No one’s going to cry if I say their pork carnitas were a little on the dry side.” I was nervous about writing anything about such a sensitive subject. Then I met Po Chen, the executive director of Youth Heartline. Now, to be clear, Po and I have never met in the real world, we’ve lobbed emails back and forth, and I’ve read his blog posts for Youth Heartline while researching this story. I’ve seen pictures — typical cyber acquaintance. But, when I learned that he’s not just organizing, but also speaking at Survive and Thrive, something made me want to know more. Now for a couple of the pertinent details, so you might actually know what I’m talking about. 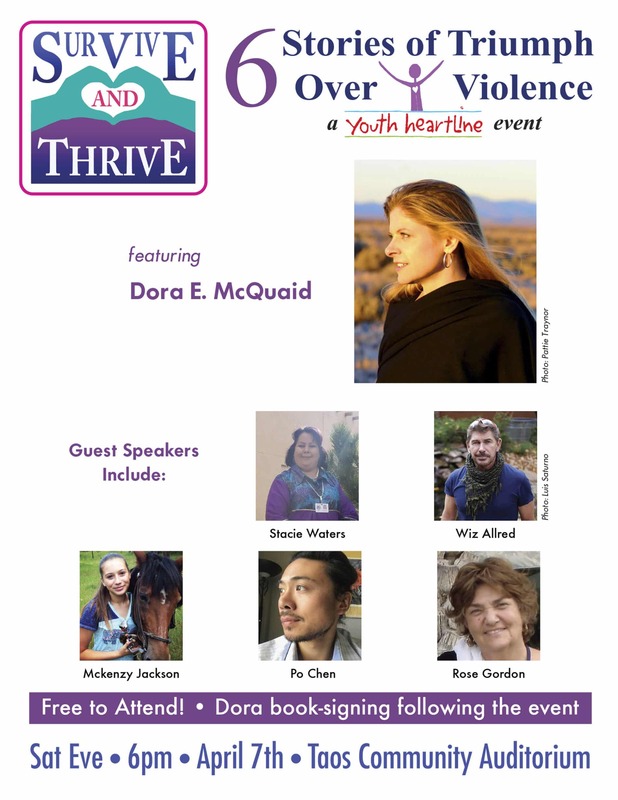 This Saturday, April 7, at the TCA, Youth Heartline is presenting Survive and Thrive. It’s an evening of six stories, all presented by members of our community, about their triumph over violence. I know these people, or in Po’s case “cyber-know” them, and they’re bravely going to talk about some raw and painful experiences that made them who they are today. Experiences that quite frankly aren’t often talked about above the level of a whisper. If these people can share their stories with an auditorium packed full of friends, family and neighbors then I can certainly write 500 words and have sexual abuse be two of those words. So what’s the idea behind Survive and Thrive? For this I turned to Po. Right, I just experienced that three paragraphs ago. It’s real. In fact, once Youth Heartline starting organizing the event, they found that there were so many stories out there to share they couldn’t fit them all into one night. Stories not just from victims of sexual assault and abuse, but from family members and service providers in our community that work to support survivors and create opportunities in which they can actually thrive. Youth Heartline reached out to local media platforms, KNCE, The Taos News, Live Taos and others to find ways to post these other stories you won’t get to hear at the TCA on Saturday night. You can read even some of them right now on Youth Heartline’s blog. The services that Youth Heartline provides to Taos, Union, and Colfax counties are astounding. They partner with any and all organizations they can find to create the invincible web of support for vulnerable children and families in our community. To find out more about their services or to volunteer or donate check out their website. And now back to Po. I was so moved by the work of this man I didn’t really know, that I had to ask him why. What does it mean to him to survive and thrive? Survive and Thrive is at the TCA this Saturday, April 7th at 6 p.m. The event is free. It features local poet Dora McQuaid, Wiz Allred, Mckenzy Jackson, Rose Gordon, Po Chen and Stacie Waters. Don’t miss the chance to hear their stories, and celebrate with them everything it takes to come out the other side and thrive.